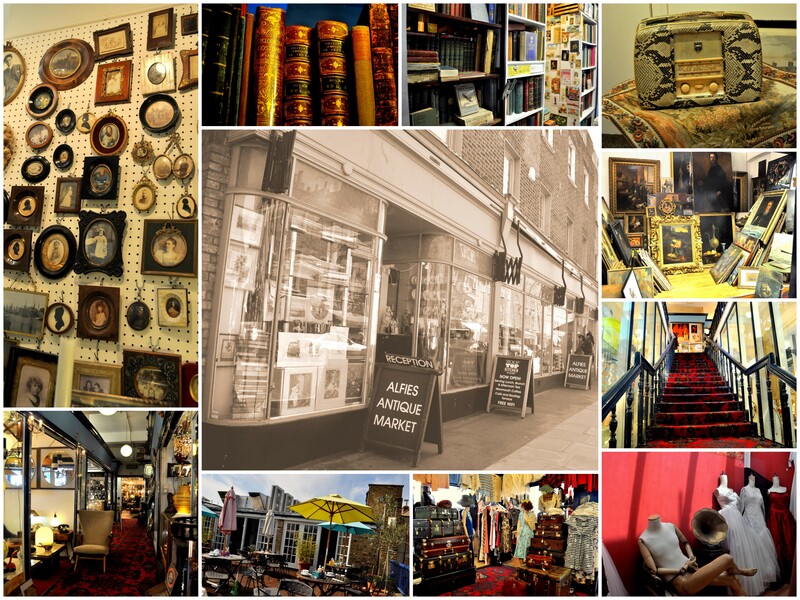 Your visit to London cannot be complete without taking a trip to its very colourful and historical antique markets. From a hearty mix of genuine and rare brick-a-bat to incredible historic items, the antique markets of London have something for every vintage and antique lover. Although there are many ancient as well as newly established marketplaces that exist in this city, I dedicated an entire week hopping from one antique set-up to another. Every marketplace has specific days when the Antique sellers set up shop and so you need to make it a point to visit on those days to get your share of the loot. In this post, I give you my top 5 Antique markets that are a must visit for the serious collectors. I believe that due to over exposure and insane amount of focus on ‘Vintage goods’, there are many sellers who pass off anything as antique. But there are still some places left in this city where you will find authentic items and genuine sellers. In my research, I made sure I spent time with the shop owners, understood their history and heard their stories. So here goes my favourite list…. 10 mins walk from Liverpool Street tube station. Every Thursday (9am – 5pm) and special themed vintage events on Saturdays (11am – 5pm) that you can track here. I suggest you visit early on to beat the crowd, lay your hands on the fresh items and get some good bargains. The Old Spitalfields market is open 7 days a week with each day dedicated to a special offering. On Thursdays the market transforms itself into an antique showroom gloriously laden with rusty goods, its traders enticing you with big warm smiles. It is ironic when you walk across big shiny glass buildings and step foot in to a huge courtyard in a Victorian building filled with tables upon tables of antique goods spilling over, kept haphazardly, giving you the feel of the older times. You will find yourself getting lost in a breathtaking array of vintage jewels & gems, war memorabilia, books and old contracts, vinyl records, furniture, ceramic vases and little knickknacks! There are rows upon rows of exciting goodies, each with a history or a story of its own that the sellers love to relate. Old Spitalfields Market in all its glory! The reason I love this market the most is because it is authentic. The sellers know the history of each piece they sell. A collector of vases, a lover of jewellery, an admirer of war memorabilia, a hoarder of cutlery; there is a piece of history for everyone to take. The collectibles come from everywhere – from someone’s backyard to carefully stored from their many European visits, leather skin collection, armour and guns to handmade masks and pots – it is all there. Young fashion students do their rounds of this market to be inspired! I did my round to get the feel of rustic beauty and soak in the vintage charm and allure, that is slowly losing its way thanks to high commercialisation and over exposure. The array of things on sale at Old Spitalfields Market..
Near London Bridge tube station, the Bermondsey Square Antique Market is on the Tower Bridge road and is open every Friday from 6am to 4pm. More details here. As you get down from the London Bridge station and walk towards the market, you will probably hesitate as all you will see around you is a sleepy, quiet residential area with a few warehouses and modern buildings thrown in good measure. But don’t be deterred. The Bermondsey Square Antique Market is bang in the middle of a high-rise boutique hotel and a fancy residential complex with a Sainsbury’s on the ground floor. Interesting choice of venue for an antique market, you say? As I spoke to some of the stall owners, I realised there is a history attached to this. Apparently much before the modern establishments came to being on that Square, it used to be a flourishing traders market tracing its history all the way back to 1855. The market was then notorious for ill-gotten and stolen commodities but over the years it has changed many faces and many shades. At its peak in the early 90s, the Square accommodated over 200 stalls of silverware, china, furniture and glassware. However, in recent times stalls have reduced to less than half but be assured, the authentic wares prosper in their 19th century grandiose. 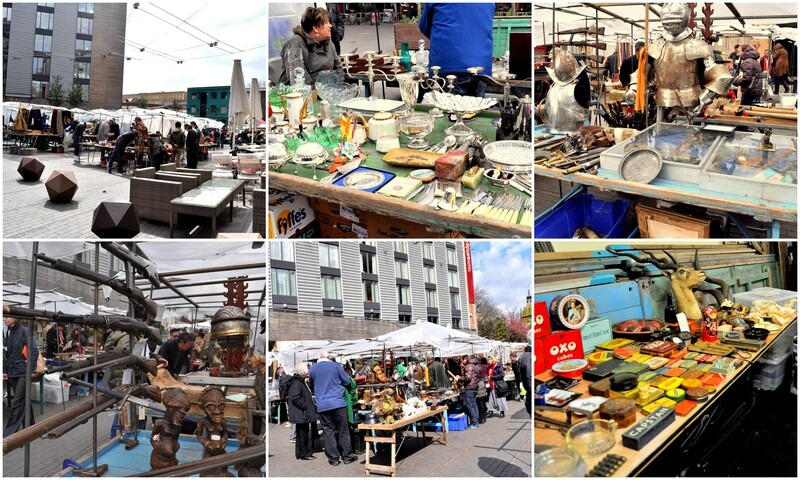 The market has an international reputation and avid collectors from all over Europe and beyond come to get a good bargain on a hidden gem. Note: Many London-based websites suggest that one must go to the market as early 5am to catch a good bargain. This is not true any more. After speaking to a couple of sellers, who have set up stalls for over half a century, the times have changed. Now the stalls set up only by 7am and they stay open till 4pm. So you can go at your own convenience. I chose this as my second favourite market because of many reasons. The market has a history that you can get a whiff of even today. Its sellers have been around for more than 25 years and have tales to tell. 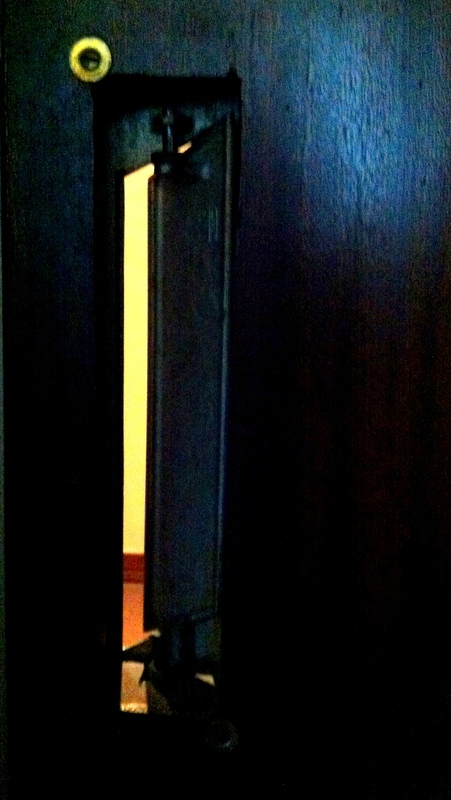 There is a story unfolding at every stall. Georgian, Edwardian and Victorian wares are in plenty. Old swords to rusty armour to salt n pepper shakers to gold-plated mirrors with intricate designs – it is all here for you to admire and buy! For a few hours you will find yourself transported to the era of open marketplaces and sellers calling out their precious finds loudly to attract attention. You will never know what little treasure you find amidst dusty old items and the bric-à-brac. There is a lovely couple by the name of Emma and Russell Bullard who have their stall of antique art called Olive & Brown. Make sure you catch up with Russell; not only is he a good bargainer but he also has some interesting tales up his sleeves from the earlier times. On Church Street, 10 mins walk from Marylebone tube station. Open Tuesday – Saturday, 10am – 6pm. Has a beautiful terrace garden café that can be your final stop for much-needed comfort food and cake. More information here. Moving on from open marketplaces by the street side, Alfie’s is the largest indoor antique market in UK. 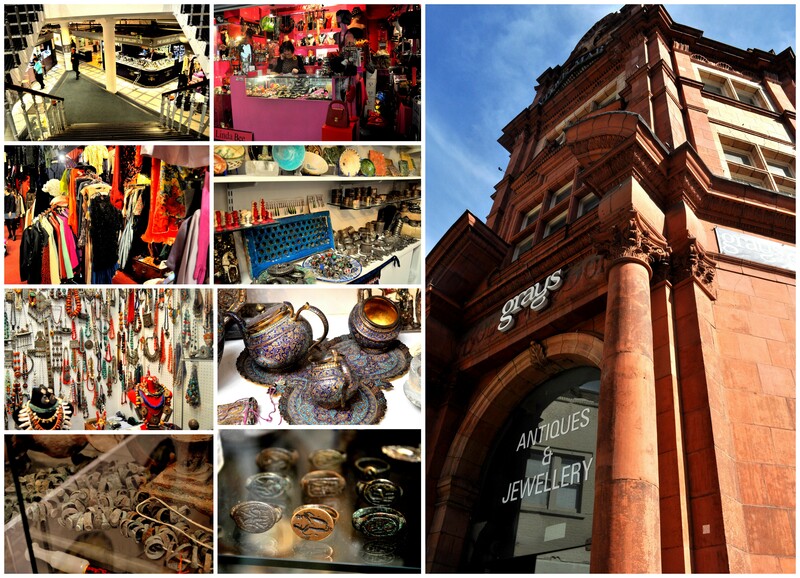 Sprawled over 4 floors, Alfie’s is a treasure hunt for avid collectors, designers and eccentric celebrities. Serious antique art and craft dealers have set up shop here who not only know the trade but if you sit to talk to them, there could be an art history lesson in order. Set aside about 4 hours for this beauty because you will find yourself getting lost in the maze of bohemian chic. Alfie’s is also famous for its vintage fashion stalls, earning a reputation among the young and hip for the place to go for 30s and 40s fashion steals. Each dealer here has a speciality. A lady on the first floor only sells photo frames. From modern to vintage to Victorian, she has collected them all. Art deco furniture, knickknacks, silverware, lamps, stamps, books dating as far back as to 16th century and jewellery – it is a little piece of heaven. I chose this on my list for obvious reasons. 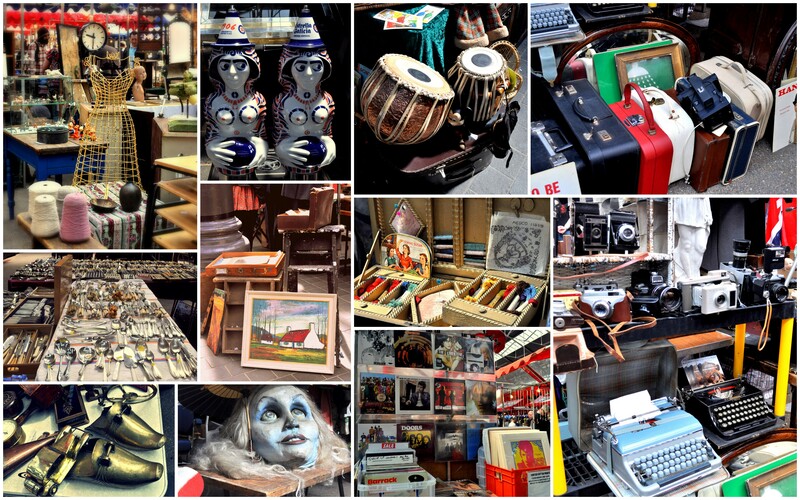 Where else will you find an eclectic mix of collectibles from different eras under one roof? Make way to a corner of oil and canvas paintings collected and displayed for over 20 years by an interesting man called Robert McCoy. Robert knows his art and knows his colours. He will interest you with his stories and travels and lets you admire each piece at your own leisure. Go to the 4th floor and meet Colin Thomson from East West Antiques and Books. He has the best collection of antique books that I have ever seen and so preciously preserved. From lesser-known English bedtime stories to British Empire in India (Vol 1 and 2) to Encyclopaedia of Costumes.. it is all there for you to browse. He also has a beautiful collection of postcards, which I assure you, will take up some of your time. I found myself settling on a low stool and browsing the postcards from 1800s where a woman has captured her travels for her friends back home and a lover has written a pining letter to his mistress. Make time for this section, I assure you, it will be worth it. And after you are done with your treasure hunt, settle in the garden café on the rooftop and take in some English sun and the scones! Bliss, right? Located on Davies Street, off Bond Street, Grays is open Monday-Friday, 10am-6pm and Saturdays, 11am-5pm. Located in an Edwardian Grade-two listed building and spreads across 2 floors and 2 buildings, Grays and the Mews. More details here. Grays Antique Centre specialises in fine art, collectible jewellery, watches and ancient artefacts from as far back as 40BC. The Grays building has many dealers specialising in vintage jewellery and you will find yourself mesmerised by ruby earrings and intricately designed topaz rings. Typical art deco collection from wine decanters to vases to specialised vintage bags – it is a melting pot extraordinaire. Although the place does not have the usual hustle-bustle of typical antique markets, it has only serious buyers – either looking to buy a piece of jewellery for their partners or genuinely interested in gemstones. Moving on to the second building, which most people miss, The Mews is about 50 yards behind Grays and actually has an interesting piece of history attached to it. The builders of Mews found a running tributary to the Thames – the ancient hidden river Tyburn. As the surrounding areas commercialised to what we know as Oxford Circus and Bond Street now, the river was culverted and so the only place it is clean and running is right here in the basement of The Mews, an annexe of Grays Antique Centre. Worth your visit now, isn’t it? The Mews houses dealers specialising in Islāmic Art, collectible dolls, Middle-eastern and Asian jewellery and other collectibles dating back to 40BC. Step into the world of Islāmic art and sculptures at Bakhtar Art. Hadi is the cheerful owner who will happily let you try out Tibetan Jewellery and Iranian gems. He also proudly shows off his collection of Roman rings and Persian tea-sets. Also don’t miss Tribal Tent which is a stone jewellery heaven for all women alike. Walls adorned with the brightest and most beautiful neck pieces, it is bound to take your heart away. And definitely stop by Mughal Art where Abdul will show you some of the best Islāmic metal-work art from 16th Century and stone work from 2000 BC. And if you are lucky to meet Riyaz, the art historian sitting in the back office, do spend some time with him. I was fascinated by his knowledge and how much he had to share. The Mews is a the treasure cove for the serious art dealers, wanting a glimpse into Islāmic, Hindu, Chinese and Buddhist art. Although the market is open Monday-Saturday, the antique section is only open on Saturdays, 9am-7pm. The entire market starts from Chepstow Villas to Goldbourne Road but the antique section is from Chepstow Villas to Elgin Crescent. 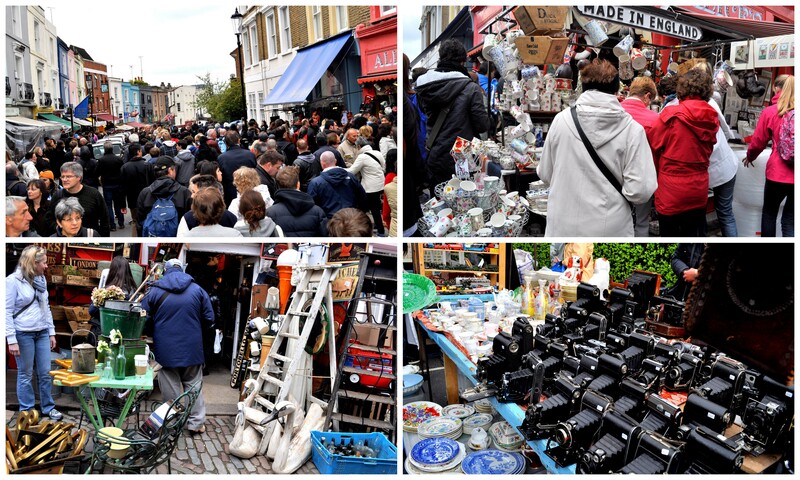 – a few stalls selling 1/4th of the vintage items that I saw at Old Spitalfields and Bermondsey. – too much crowd to handle!! In my opinion, it was not worth the noise. I found it oversold and too much to handle. However, for the serious antique lovers, there are some Antique Arcades that you could step in to and maybe start at 7am to miss the crowd but be ready to fight your way in/out. Also, some of the antique arcades are open on Fridays too, so you could go to the Portobello market to really experience its true form. So this is my little list of genuine antique markets that one must visit when in London. Of course I missed Camden Passage market, but if you have been to Spitalfields or Bermondsey, it is quite the same.. except for the vibe, which is very eccentric in Camden. 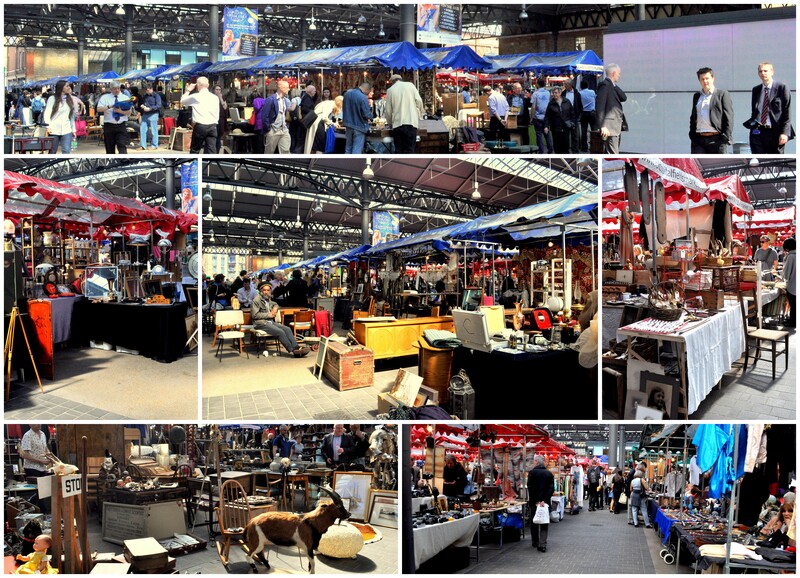 Also there is the Covent Garden Monday Antique market that could be worth a quick visit. 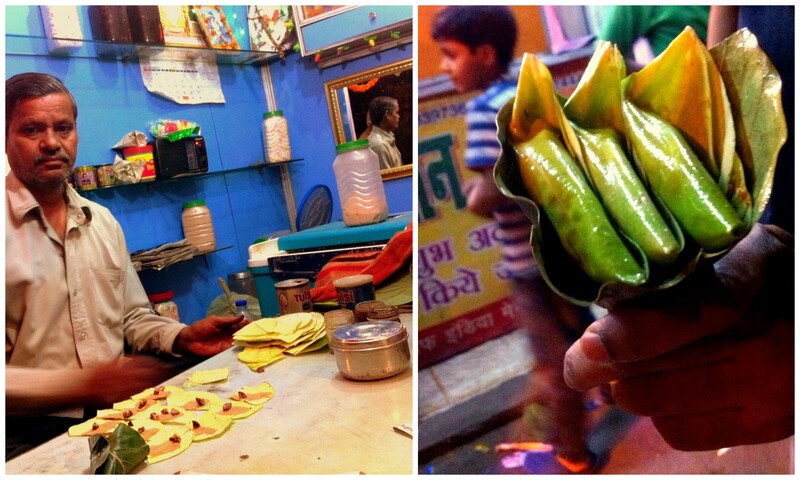 I love the Sweet Paan. The moment you put it in your mouth, it melts and takes over all your senses making you feel light and happy. It is also so much better after a heavy meal 😉 This picture was taken in Lucknow, India.. famous for the Maghai Paan variety. Just look at that size!! So anyone knowing where I can get nice Sweet Paan in London will get lots of love from me! I know it is pouring cats & dogs & all the other animals in London. 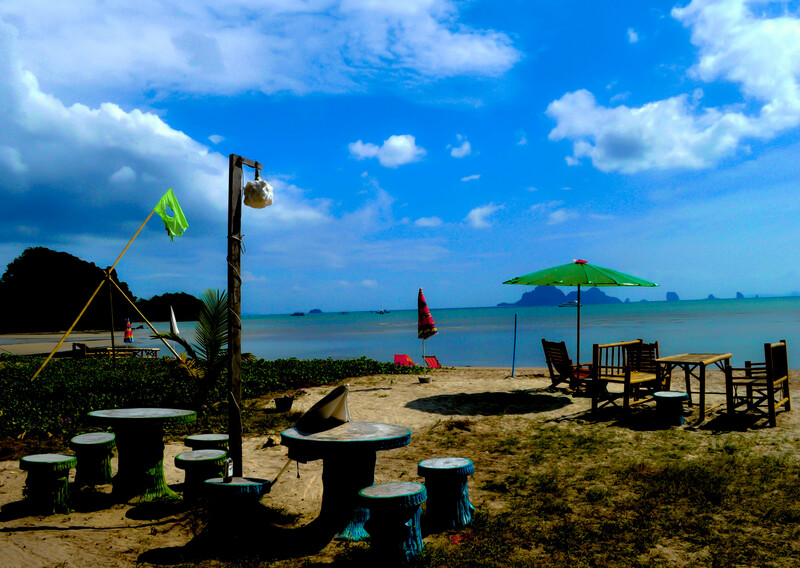 It is dreary and dull and everyone worth their summer salt are hating to sit indoors, freezing to death. 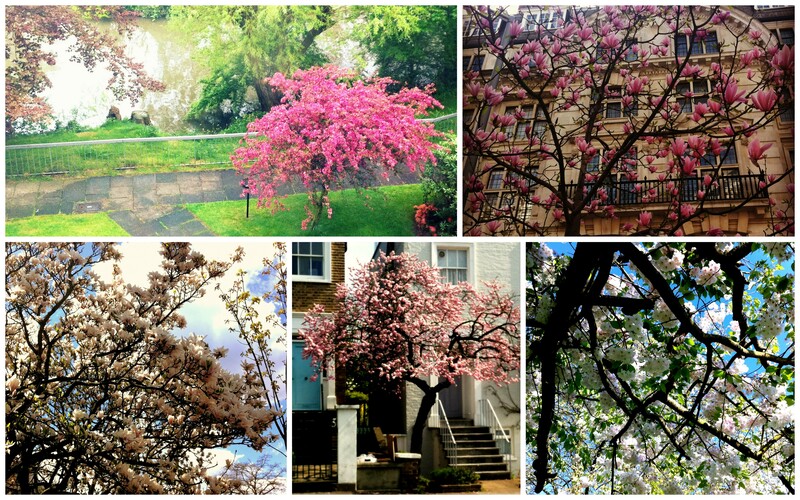 ’tis the Season of Blossom! Day 16: This is not a regular happy red pretty Mailbox photograph! Do not say, I did not warn you. I don’t have a mailbox in my house or in my vicinity nor did I order anything online (aaaah! those were the days..) for me to receive it.